This is about the 6th century… Dark Times. You will need to go to Badbury Rings in Dorset and head to the west side of the outer rampart. Stand where the great Roman road, known as the Ackling Dyke, touches the hillfort and then look north. From the Badbury Roman cross-roads take the road to Old Sarum (nr Salsibury) where there is another hillfort at another cross-roads. After the Roman conquest, just like at Badbury, a small Roman town grew up nearby. At Badbury it’s Shapwick (Vindocladia) at Old Sarum its Stratford sub Castle (Sorviodunum). The Roman administration lasted about 400 years then the troops left for the continent and Britain sorted out its own politics. It broke up into factions, petty political infighting and one by one these new Romanised British states caved in to alien cultures from outside the old empire. Our modern counties tell the story of conflict and the place names of our villages and towns in the east are almost exclusively Anglo-Saxon. Bit by bit the Roman centres were abandoned or taken over. In recent years it has been suggested that British and Germanic incomers integrated more amicably than has traditionally been believed…but ancient DNA compared with DNA from modern populations argues for the old fashioned view …that the Brits were ethnically cleansed from the east. Early aerial photograph of Badbury Rings (Wessex from the Air 1928). The Ackling Dyke runs top centre to centre left. Notice the way the outer rampart touches the road and covers its south eastern bank and ditch. The Devil’s Footprint is top centre cutting the road at right angles. The line has subsequently been rebuilt but over the years has slumped into the old cutting. Badbury at the cross-roads needed re-fortification. Imagine standing here in the 6th century.. can you feel the vulnerability. What happened? There are three ramparts around the hillfort. The two inner ones lie close together and look similar…they are Iron Age. What about the outer one? It is further out, slighter, bit humpy…unfinished?. Some say it was built about AD 44 ..on the eve of the Roman Conquest, but stand on the west edge where it runs beside the Ackling Dyke and look at the earthworks. Which came first? The great Ackling Dyke is 25m across. Late Roman banks and ditches flank the road on either side. Recent LiDAR laser scans, along with aerial photographs, show something new. The east road bank is cut by Badbury’s outer ditch. Excavation at Shapwick has shown that the road is late 4th century…so Badbury’s rampart is later still. Last week I visited and saw it on the ground. Then there is the chalk quarry just a little to the north.. known as the Devil’s Footprint. It runs from the rampart across the line of the road to the steeper slope to the west. Once it was covered in gorse but NT rangers have now made the earthwork clearly visible and it is not a random digging. It cuts the Ackling Dyke at a right angle. A wide formidable defence acting as a cross-ridge dyke. 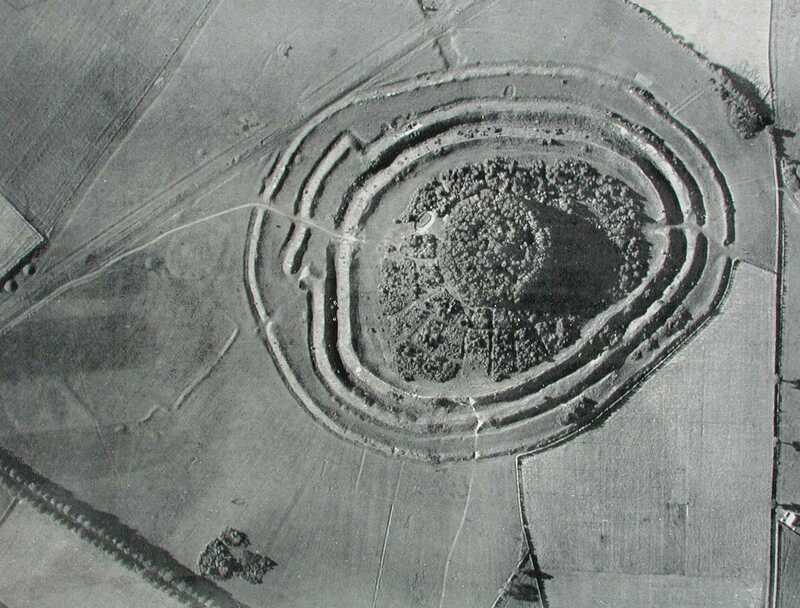 Back in 2004, we radiocarbon dated the re-occupation of the hillfort to the 5th century, so good evidence that Badbury’s people re-made this place as a fortress. The British Dorset militia quickly threw up Badbury’s outer rampart and dug the wide trench, the ‘Devil’s Footprint’,to hold back the Saxon tide…. well..now..as the archaeology of the earthworks has demonstrated, there’s a strong argument to be made for this. This entry was posted in Archaeology, Badbury Rings, Discoveries, Dorset, Hill Fort, Hillfort, Iron Age, laser scan, NT archaeologists, Roman and tagged Dark Age by martinpapworth. Bookmark the permalink. If you look at the Badbury Rings in Google maps, there’s a lovely crop mark of the old road. The Roman roads at Badbury are very interesting and the best in Dorset hard to compare with anywhere else. The google image you told me about is good. You can see the Dorchester road overlying the Bath road and then the dark line of another ditch cutting across the top of the Dorchester Road. Where it joins King Down the Dorchester road meets the Hamworthy road and the remains of the earthwork for the junction lies just within the woodland edge.